Situated at the corner of 9th Street & Marleau, Cornwall, Ontario, just north of the Hotel Dieu Hospital. 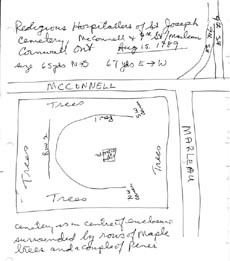 This cemetery is is in the centre of the enclosure, surrounded by rows of Maple trees and a couple of Pines which is surrounded by a wire fence, with a gate facing Marleau Street. The first row of stones is in a `U' shape to the north, the 2nd row is straight east to west. It was copied 1st on August 15, 1989 at which time there were 45 markers. John Purcell gave the land for the Hospital and Cemetery. Sister Mary Joseph, nee Mary Ann McDougald died Dec 23 1926 or 0? Sister Catherine nee Adeline Carriere died Jan. 28 1914 in her 29th year. Sister Janet MacDonell, Foundress, died May 3rd 1937 age 88 yrs.